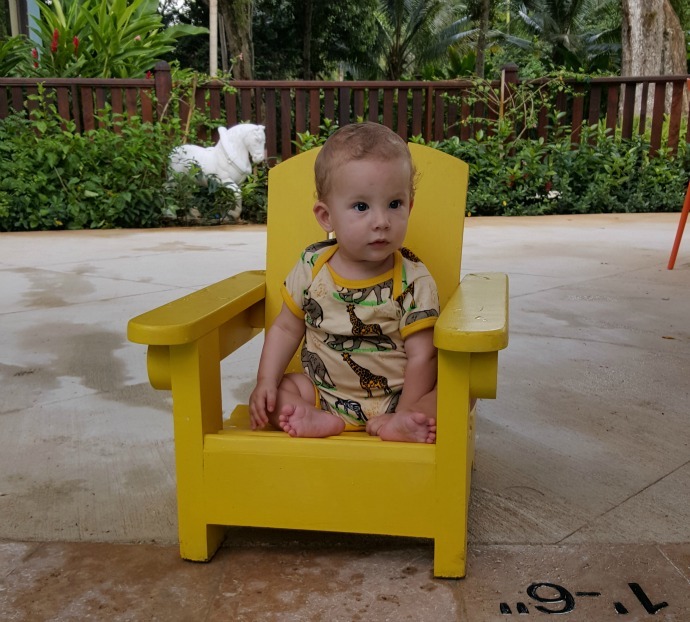 During our recent trip to Jamaica with Beaches we managed to visit both of their family friendly resorts. 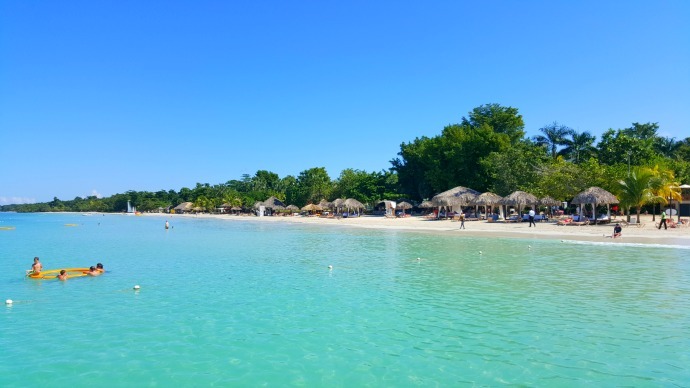 I wrote recently about my thoughts on Beaches Ocho Rios - a beautiful private slice of paradise on the North coast and our transfer across to the island took us to the west coast Beaches Negril. Beaches Negril has the same outstanding hospitality that I had already come to expect after our three days in Ocho Rios but it is more spread out and sits along the famous seven mile beach. The sand is still as bright, the sea still as clear and the atmosphere still as friendly, but the layout was different and much more accessible in my opinion. Whilst Ocho Rios had lifts meaning nowhere was out of bounds, Negril doesn't need them. My room had a ramp leading in making it perfect when I had a sleeping little one in the pushchair and the main pool was right outside our door, the beach only a few extra steps away. Negril seemed much bigger and like its sister site had three pools, a water park, a kids camp and X-box room and a huge variety of places to eat and drink. My room here was more compact than in the last resort, but it was perfect for the two of us and still had a living space alongside where we would sleep. The fridge came fully stocked, and whilst there aren't kettles provided as standard in these rooms (there are coffee machines instead), the staff were more than happy to find one for me and it was delivered almost as soon as I had asked for it. I was delighted to see how imaginative the staff were with their towel art in Negril and we often came back of an evening to find one of Finn's toys had joined in the fun. I think this would have been a real hit with my big boys, finding out what their belongings had been up to whilst we were out. Finn and I were still in an early rising, early to bed habit and it was ideal as the sunrises were just as stunning this side of the island. Whilst there is plenty to do in the evenings, including the Liquid nightclub, bars and restaurants, the resort quietens down quite early, making it perfect for young families. We went along to the weekly beach party one evening and by 9pm it had moved away from the accomodation so that we could all sleep peacefully. The beach is stunning and kept mostly private. Security patrol both ends meaning you still feel relatively secure although you do find people trying to sell you stuff on the odd ocassion. I loved the private beach of Ocho Rios but it was great to enjoy such a large beach too and have the option for a proper morning walk with your feet in the already warm sea. 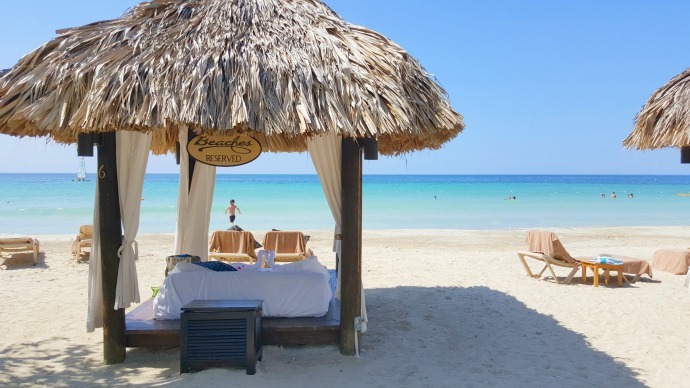 Negril had some beautiful Cabana beds that could be hired for an extra cost, but came with towel art and rose petals and a private butler to bring your drinks. Finn and I used to lay on them first thing in the morning as he drank his milk and we watched the sunrise and they felt so completely luxurious. There are three pools around the resort and our favourite was the main pool situated right outside our front door. There was a bridge to walk over it or swim under and of course a very well stocked swim up bar. The pool was never too busy that you couldn't grab one of the floating sunbeds and soak up the sun with the water still cooling your back and there was plenty of seating and sunbeds in every direction. The water park had a couple of great slides as well as a lazy river which was an ideal way to cool off and relax. Finn and I made sure to test out the mini toddler pool which was always deserted, possibly because it was situated away from most of the action. It was really sweet, more like a giant paddling pool than a swimming pool and with little kids sunchairs around the water as well as in it. For children getting used to water for the first time it was ideal as it was so quiet and shallow that they could splash in peace before joining the bigger pools. The choice of restaurant was rather similar to Ocho Rios with a few extras. The main restaurant served a buffet every meal and was open for a continental breakfast from 3am - perfect for those struggling with the jetlag. 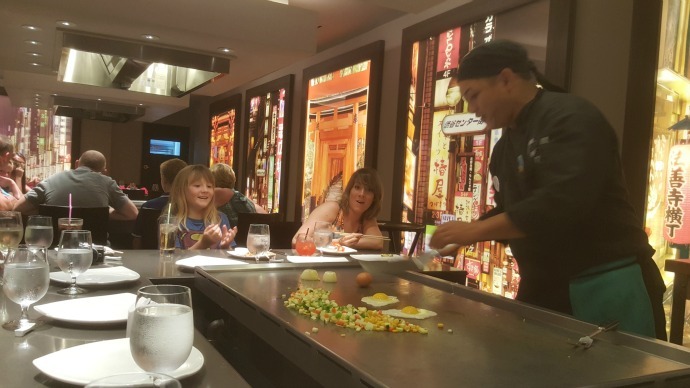 I had two favourites that I would highly recommend bringing to the top of your list to try, Kimonos which was Japanese but in the most theatrical manner. The chef stood by a hot table in the middle of the guests and cooked up noodles and a variety of fish, meat and vegetables whilst singing, dancing and juggling utensils and ingredients. I left Finn sleeping in the kids club when we visited Kimonos as there is more of a party atmosphere, however there were plenty of young children. The food could be kept plain for the fussy eaters and it tasted even more delicious after you had watched it all cooked freshly in front of you. 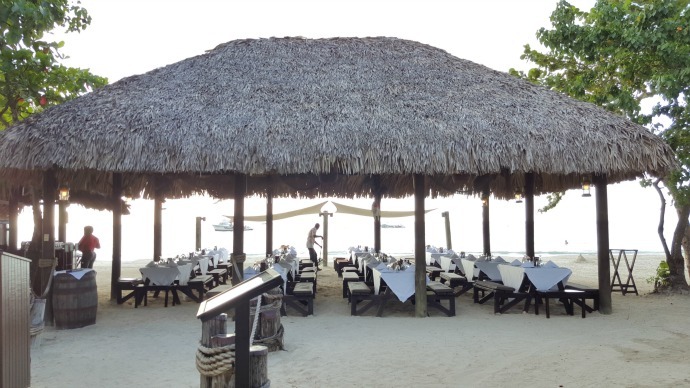 Stewfish not only served a great variety of tasty meals, but located right on the sand, the views were spectacular. Everything on the menu sounded fantastic and the Actually Mummy family ate there most days, persuading us that it was the best lunch venue on the resort. I didn't make it down there for breakfast, but I can only imagine it to be a stunning way to start the day. 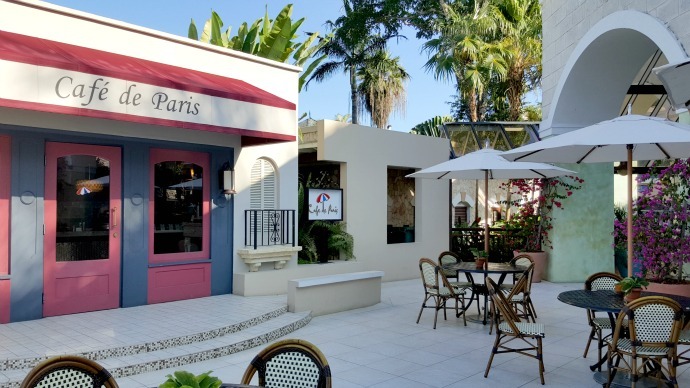 Cafe de Paris was the sweet treat equivelant of the Creperie in Ocho Rios and opened from early in the morning until around 10:30pm. Serving pastries, proper coffees and a selection of ice creams, for some reason it felt more indulgent visiting here than anywhere else. I could get used to the all inclusive with my food and drinks but to visit a little boutique coffee shop I felt like I should be paying extra. As the weather stays warm day and night, an after dinner trip to Cafe de Paris for some ice cream felt indulgent and the perfect way to end a day of sunshine too. 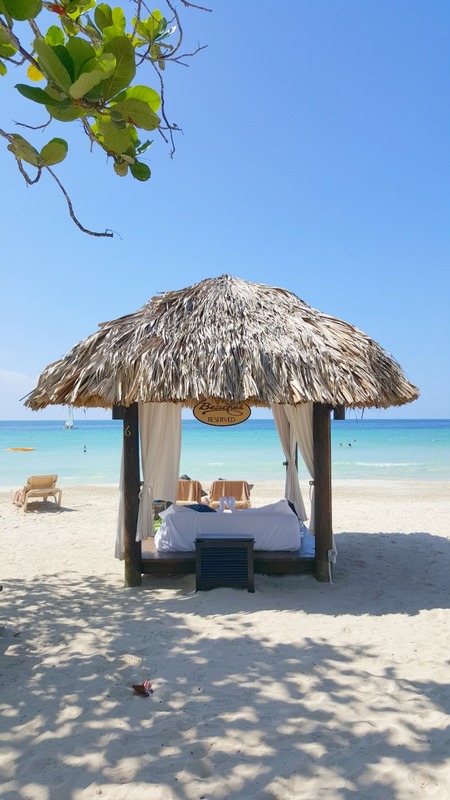 Whilst both resorts are on my list of places I am desperate to get back to, Negril has the edge when I think about visiting with my four and two year olds. 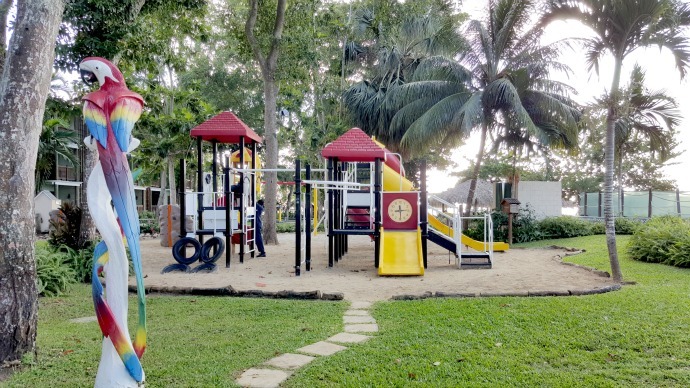 Alongside the sea and pools, Beaches Negril has a playpark and miniature golf which I know they would really enjoy as an alternative. As part of their commitment to conservation, many of the trees that have died around the resorts have been left where they are and transformed through carving and paint into magnificent statues that add even more colour and fun and spotting them would be a great activity for toddlers. The parrot one below is one of my favourites. 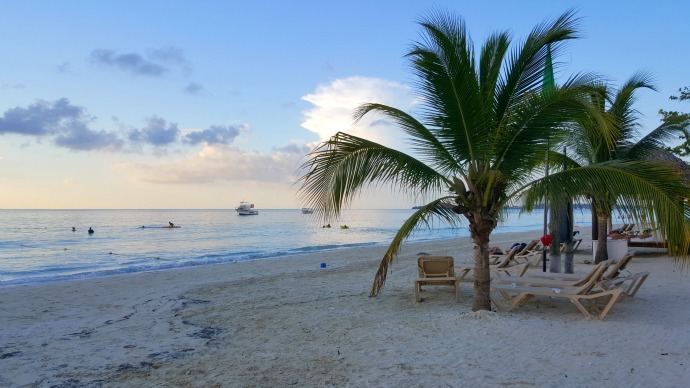 Whilst luxury is well and truly included on a Beaches resort holiday, there are ways to spend any extra money you may have brought with you and at Negril I tried out three of the options, all of which I would thoroughly recommend. I don't know how much convincing you need to book a spa treatment, but with the Red Lane Spa being on resort and after having had a taste of their products as they supply the in-room toileteries, it didn't take much for me. I walked in not really sure what I wanted, but after a warm greeting and a short chat with the friendly guy behind reception I had a deep tissue massage booked in for the next day. Travelling with children can be stressful but the moment you walk into the spa there is a real sense of calm. The luxury extends to every area and after spending an hour fighting to stay awake as the massage was so relaxing I left feeling refreshed and pampered. 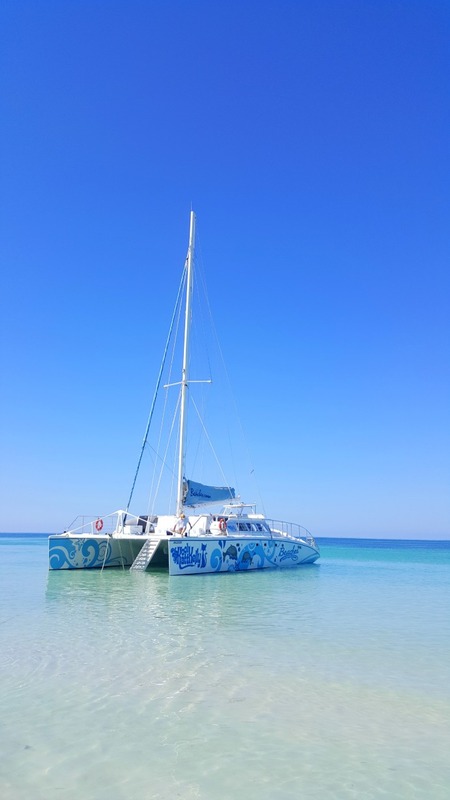 If you really want to see how crystal clear the water is, then the catamaran trip with Island Routes is a great way to explore. Our boat came ready to party with its own DJ and the bar was still all inclusive. I loved lying on the boat soaking up the sun, and Finn took the opportunity to have a super long snooze below deck. You can't bring a buggy on board but the cruise is completely suitable for children. The staff were great with Finn and more than happy to keep an eye on him whilst I stood on top and watched the dolphin swimming along side us. We stopped midway to go snorkelling and the waters are still as clear as near the shore. The guides found us 'sand dollars' to explore and we saw amazing reef and sea creatures. We carried on to Margaritaville, a party place around the coast where we stopped to play in the sea, grab some drinks from the bar and enjoy somewhere a bit different. the back of the catamaran had a slide into the water and floating in the sea in front of Margaritaville was a giant inflatable that you could climb up and dive into the sea from. Getting on wasn't easy, but it was certainly a workout and diving into the crystal clear waters from several feet up was exciting. One of the most interested parts of our trip was the Reading Road Trip organised by the Sandals Foundation. Beaches is only one side of Jamaica, and getting out of the tourist area and into the 'real' Jamaica was an eye opener. Poverty is incredibly real and illiteracy a widespread problem. 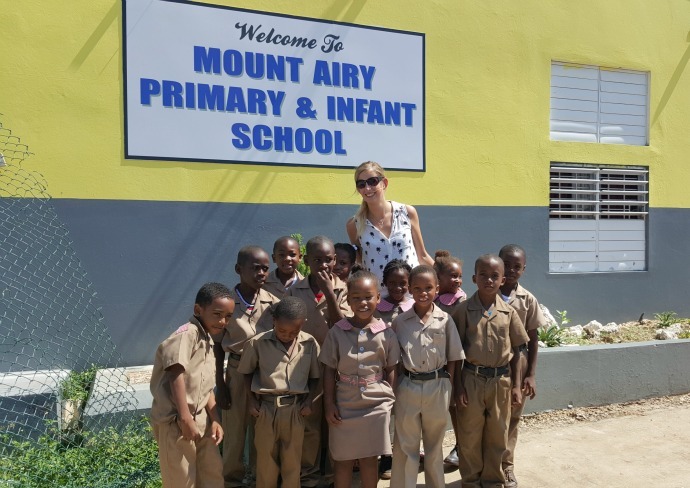 We visited Mount Airy Primary School, a school built for just over 200 which currently has well over 500 students. We saw teachers that were responsible for educating over 60 pupils without help and it made me realise how lucky we are in the UK where Dylan's teacher has two TAs to help out in her class of 29. The staff and students were making the best of what they had and relying on the kindness of the foundation and visitors to stock their library, provide suitable desks for the children and to offer early reading help. In such big classes, small groups aren't easy and with many parents unable to read, children are not getting help outside the classroom. I had a group of three grade 1 pupils who were around 6/7 years old and I read with them and did activities. They were so eager to learn and I wish I could have done more. 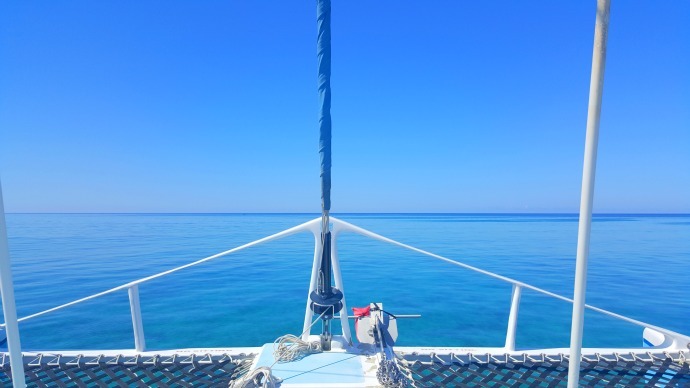 Sandals and Beaches are one of the biggest employers in Jamaica, but they are making a difference all over with their charity and visiting is a great way to give back whilst you are there. I would love to take Dylan on a trip like this, open his eyes to how different children learn and education in other countries. Our trip to Jamaica with Beaches was simply amazing. Every single detail was well thought out, every member of staff went above and beyond and every meal was just delicious. 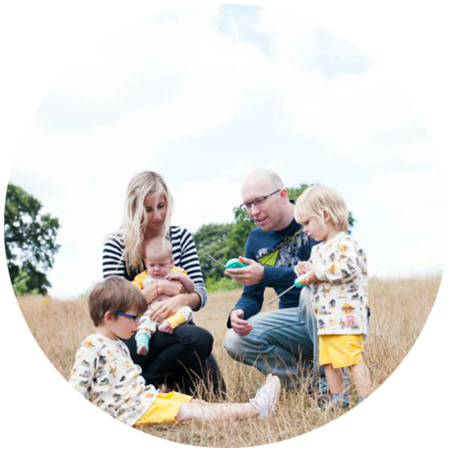 Their motto of 'luxury included' couldn't be more true and I would love to visit with the whole family in the future. 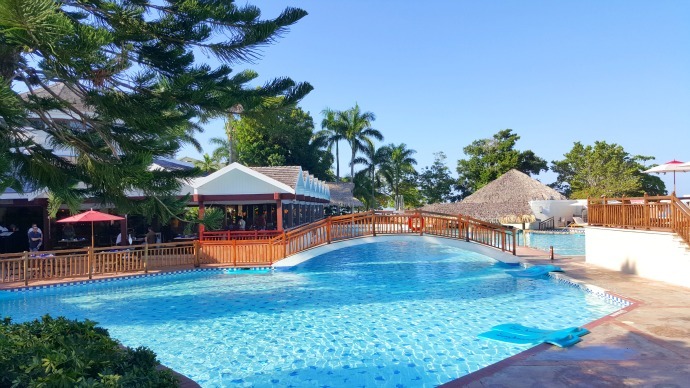 Seven nights staying at Beaches Negril Resort & Spa costs from £1,989 per adult and £899 per child. Price includes Luxury Included® (all-inclusive) accommodation in a Negril Deluxe Room, return economy flights from London and resort transfers. Valid for travel dates 2nd May – 24th June 2016. Island Routes Reggae Family Catarmaran Cruise is available through Island Routes Caribbean Adventure Tours. Prices from $95 per adult and $66 per child. For more information visit www.islandroutes.co.uk. Sandals Foundation Reading Road Trip costs $25pp. For more information visit www.sandalsfoundation.org. 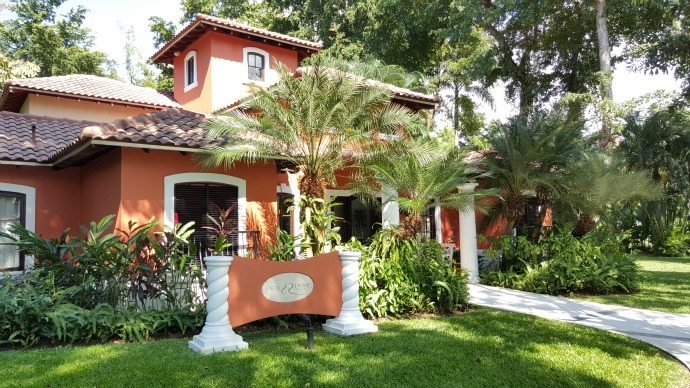 We were guests of Beaches for the week to try out their Luxury Included resorts. All thoughts and photos are completely my own. 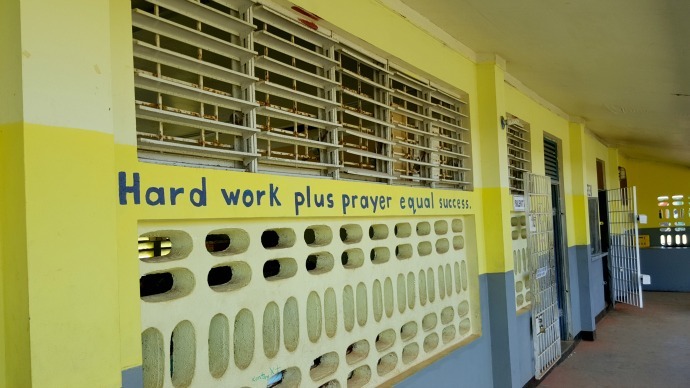 I would have loved to come on the visit to the school - such good work Sandals are doing in Jamaica with the children there. I'm getting the feeling you will be booking to go back - if so then you definitely need to try the French Toast at Stewfish - I'm missing it already! Oh wow. What amazing work they are doing. I bet this holiday has formed many memories for you. This looks stunning. 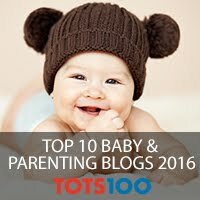 I'd love to head to a Beaches resort for a holiday as family friendly is now at the top of my most desirable holiday traits! We stop on poet in Jamaica in Jan so I'm lookinh forward to exploring a bit! Wow what an amazing place to visit, that sand looks so lovely to walk in. Beats the beach huts we get at our beaches! This looks like paradise, so beautiful! The towel art with Finns toy is such a cute thing to do. It's wonderful that Beaches do so much to help with the school. Wow-wee! Look at that blue sky and white sand!! What a beautiful place and amazing work they are doing, I never knew! Wow, looks amazing! I was jealously following everyone's adventures over half term. gorgeous photos and it looks even more appealing in the horrid weather this week. 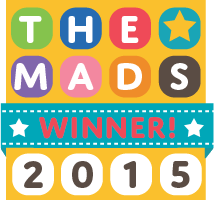 I love the Beaches ethos and the work they do in the wider community. Both of these resorts sound amazing:) I have been on the seven mile beach during my time working on cruise ships, it is truly spectacular. 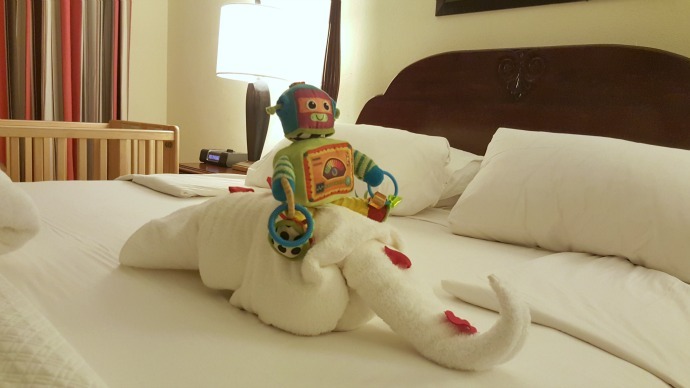 I love it when the house keepers go the extra mile and do the towel art, so much fun for kiddies! The water sports on offer here and the spa sound fabulous. The school visit sounds like an incredible experience.